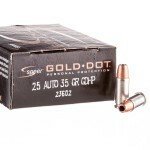 More noted for its handiness in a deep concealment setting than for its stopping power, the .25 ACP is a centerfire cartridge comparable in ballistic performance to the .22 Long Rifle. 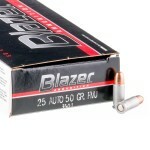 However, the .25 ACP's centerfire design makes it more reliable in semiautomatic handguns. 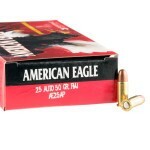 In metric notation, this cartridge is referred to as the 6.35x16mm. 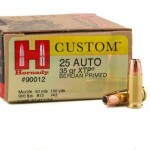 It is a semi-rimmed cartridge that uses small pistol primers. 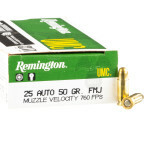 A typical round of .25 ACP ammunition fires a 50 grain bullet at a muzzle velocity of about 760 feet per second, assuming a two inch barrel. 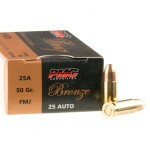 The .25 ACP is the smallest of the centerfire pistol cartridges developed by John Moses Browning. It was introduced in the early 1900s with defensive use in mind, as reflected in the lineup of subcompact handguns offered from FN and Colt at the time. 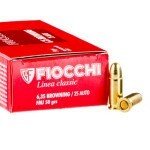 At the time of its introduction, the .25 ACP's jacketed bullet represented a significant advance in reliability over that of the lead-nosed .22 LR. 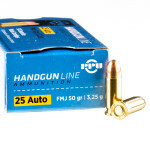 Notable handguns chambered for this caliber include the Beretta Model 21, Taurus Model 25, Baby Browning, and Walther TPH. These are all highly compact pistols that may be concealed where a slightly larger firearm would print visibly. 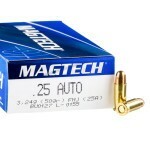 Since this cartridge is primarily used for concealed carry or target shooting, available .25 ACP ammo is mostly of the full metal jacket (FMJ) or jacketed hollow point (JHP) varieties. 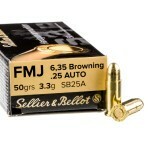 Unlike most calibers, the .25 ACP is used defenisvely with FMJ projectiles as a means of improving bullet penetration, due to the cartridge's limited power. However, modern JHPs offer a high-expansion alternative that performs much better than the designs available for most of the 20th century.